Yesterday, Paul mentioned the threat posed by cows. 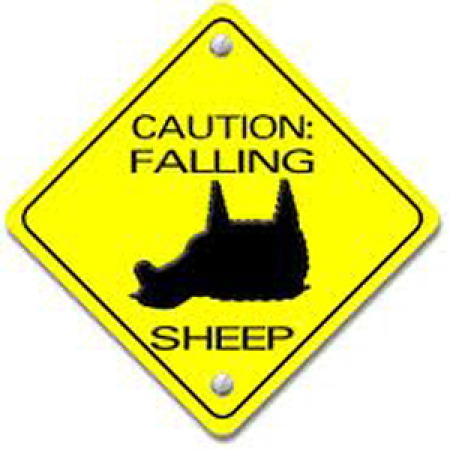 It's worth remembering that sheep can be pretty dangerous too. As this hiker in Ireland recently found out when, out of the blue, he was hit by a falling sheep. Both the hiker and the sheep seem to have survived the incident. 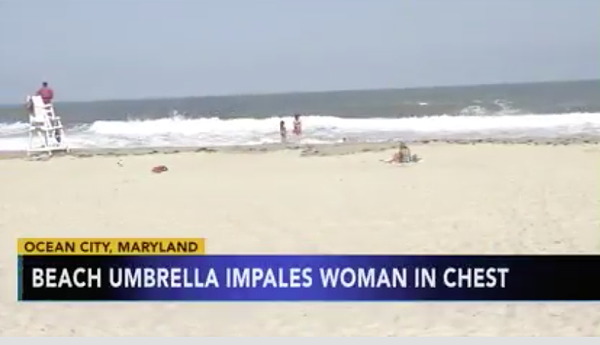 In Ocean City, Maryland a woman was recently impaled in the chest by a wind-blown beach umbrella [6abc.com]. 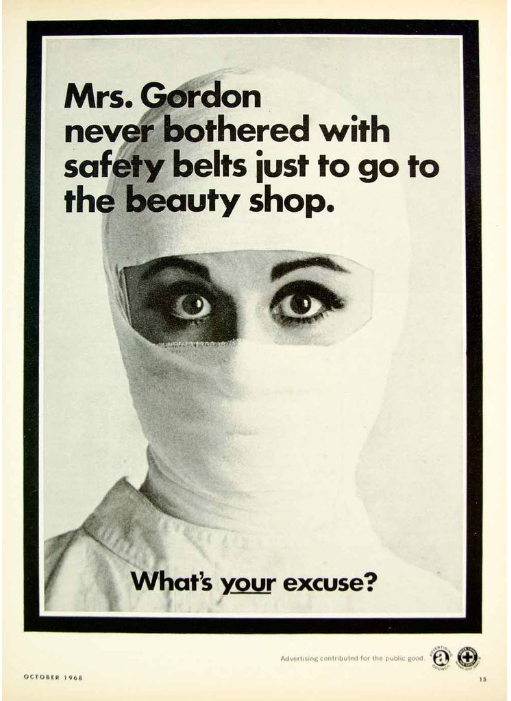 She's alive, but I assume in serious condition. And just a week before another wind-blown umbrella stabbed a woman in the leg at the Jersey Shore. The umbrellas are active this summer. We've reported a number of other attacks by wind-blown umbrellas here on WU. In 1979, Paulette Fabre was killed by one on the French Riviera. And in 2010 a woman at Ocean City (again!) had an umbrella go straight through her thigh. Forget the sharks in the water. It's the wind-blown umbrellas people need to worry about. 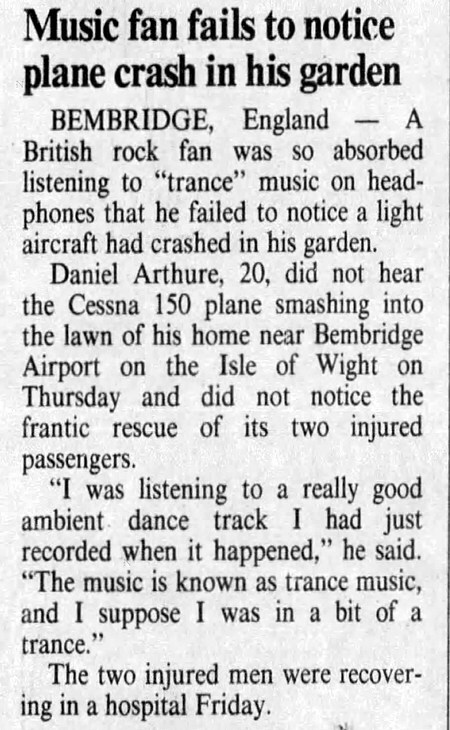 If a plane crashes in your yard and you didn't heard it, did it make a sound? How far back do the roots of Chuck's "Armed and Clumsy" category extend? The Wikipedia entry on handguns says: "The first handheld firearms that might better be called "pistols" were made as early as the 15th century..." Could we find a report of some soldier of the era accidentally wounding himself? It's a challenge! 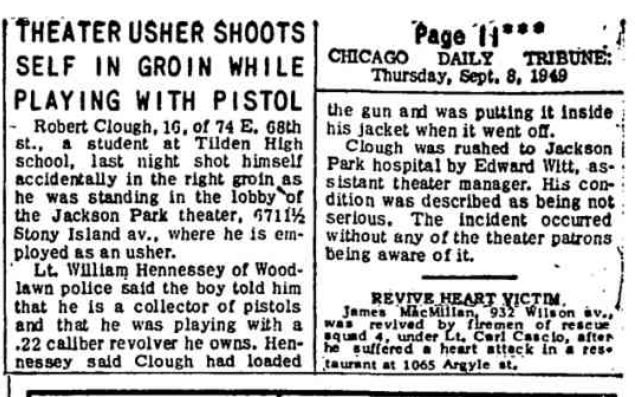 In any case, here is an incident from 1949. It's like the Fourth of July version of "Grandma got run over by a reindeer." 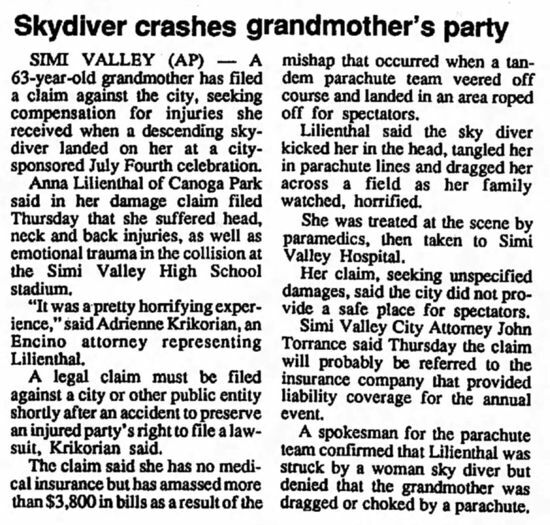 Lilienthal said the sky diver kicked her in the head, tangled her in parachute lines and dragged her across a field as her family watched, horrified. 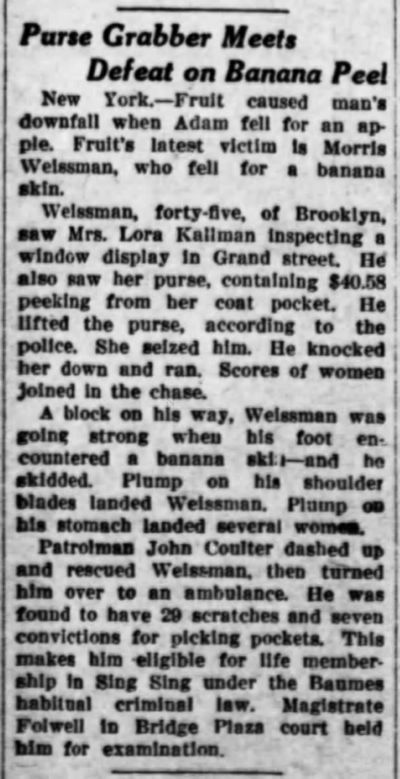 I came across a 1927 case of a cliche come to life — a thief fleeing on foot who was caught because he accidentally slipped on a banana peel, which sent him sprawling. I figured that Chuck must have documented cases of people who have slipped on banana peels, and sure enough he has. 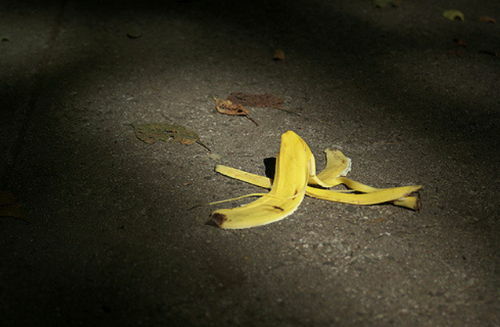 MythBusters has investigated whether you can really slip on a banana peel, and they concluded that although it's not as easy to do as the cliche might suggest, it's definitely possible. Older skins are more slippery. They also note that the cliche originated in the early 20th century after bananas first became a popular fruit, which led to numerous old skins littering sidewalks, and therefore numerous accidents. An unusual accident that recently occurred outside a post office in Kingmont, West Virginia has elements of a Rube Goldberg contraption. An 87-year-old woman was backing out of her parking spot when she accidentally hit the accelerator. This caused her car to spin 180 degrees and hit a van. The van was knocked to the side and hit a jeep. 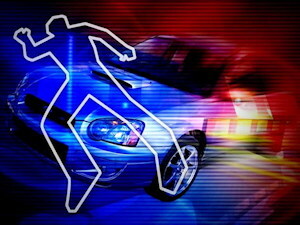 The jeep started to roll forward and hit a concrete barrier. The poles holding the concrete barrier in place snapped, and the barrier fell over, landing on the foot of 75-year-old Patricia Piercy. Piercy was subsequently taken to the hospital for her foot injury. She was the only one hurt.